"These boiled chicken wontons are delicately flavored and would go great in a chicken-based soup." Mix chicken, egg, green onion, soy sauce, sesame oil, vegetable oil, and salt in a large bowl until evenly combined. Scoop about 1 teaspoon chicken mixture and place into the center of a wonton wrapper. Moisten 2 adjacent edges of the wrapper with water and fold into a triangle. Connect the two lower points of the wrapper and moisten to seal and make a hat shape. Repeat with remaining chicken and wonton wrappers. Bring a large pot of water to boil. 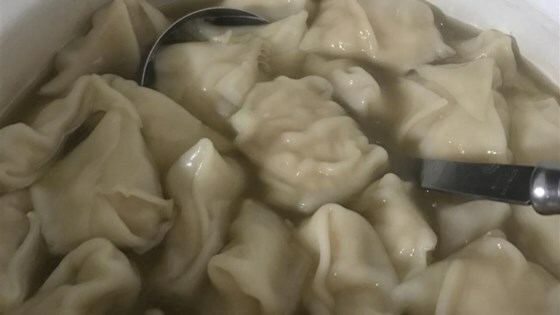 Stir wontons into boiling water. Add 1/2 cup cold water and allow water to return to a boil. Repeat boiling with another 1/2 cup cold water. Wontons are ready when chicken is no longer pink in the center, about 5 minutes. Drain. Crispy, dipping pockets of buffalo chicken! If you're making your own wrappers, DO NOT BOIL, I used my recipe for the wrappers and upon boiling them they fell apart and left a gooey mess in the bottom of my pot. I used these wontons in a simple chicken broth with scallions soup. Perfect for a sick kid . I used cooked chicken because it was handy. The Wontons turned out great and even impressed my very skeptical millennials. This will be a 'go to' recipe. I added 1/2 carrot that I julienned into the stock before I added the wontons and it was a nice addition.